Can You Reuse Oil After Deep Frying? If you are just getting into frying for the first time, you may have a lot of burning questions you have been waiting to ask. Important questions about frying skills and technique that cannot go without answering. For our new and future fry masters out there, frying food in a deep fryer can be something that takes a bit of practice, but when you get the hang of it, it is so gratifying. 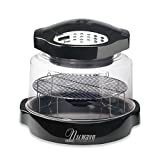 One of the questions that we get the most from anyone who is just getting into frying for the first time is “can you reuse oil after using your deep fryer?” There are several best deep fryers on the market. Some of them; for instance, T-fal FR8000 EZ Clean Deep Fryer, even have an oil filtration system that drains, filters, and stores your oils for future use. 1 Can you reuse cooking oil after deep frying? Can you reuse cooking oil after deep frying? The answer is yes and no. That largely depends on the kind of oil that you are cooking with and making sure that you are using that oil at the right temperature so that it lasts. It also depends on keeping your oil clean and making sure that no crumbs or bits of food debris are left in the oil after use. Most frying experts will recommend that you use a budget friendly oil that has a high smoking point. The higher the smoking point of the oil that you use, the less likely that you will start burning your oil. When you hit an oil’s smoke point (the point at which it starts smoking) the oil begins to break down and destabilize. If the oil starts breaking down, it is going to be no good for cooking. Check out the healthiest oil for deep frying. All of these oils are relatively budget friendly and have relatively high smoking points, so that you don’t have to worry about burning your oil. Here are a few items that you should consider before reusing your oil. Did your oil reach its smoking point? If it did, you will need to change your oil immediately because it has already started to break down, and it will not cook your food as well for future frying. Are there food bits swimming in your oil? If so, you will need to filter out your oil and collect the remaining bits of food, so that they don’t burn up in the oil the next time you cook. What have you been cooking in your oil? Keep in mind that when reusing your oil to cook different types of food, the oil is going to adopt those flavors as you cook with it. For instance, you may want to separate the oil that you use to cook donuts from the oil that you use to fry shrimp so that you don’t have unpleasant overlaps in flavor. Some deep fryers are developed to help you store used oil easily. For example, Presto 05450 DualDaddy comes with a Snap-On Storage Lid whereas T-fal FR8000 EZ Clean and T-fal Filtra One Cool Touch Deep Fryer have a unique oil filtration and storage system. If you are going to be reusing cooking oil, we have a few pointers you can use to store oil from a deep fryer and get it clean and ready for frying.